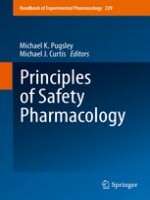 This book illustrates, in a comprehensive manner, the most current areas of importance to Safety Pharmacology, a burgeoning unique pharmacological discipline with important ties to academia, industry and regulatory authorities. It provides readers with a definitive collection of topics containing essential information on the latest industry guidelines and overviews current and breakthrough topics in both functional and molecular pharmacology. An additional novelty of the book is that it constitutes academic, pharmaceutical and biotechnology perspectives for Safety Pharmacology issues. Each chapter is written by an expert in the area and includes not only a fundamental background regarding the topic but also detailed descriptions of currently accepted, validated models and methods as well as innovative methodologies used in drug discovery. This book is the first resource book in either Pharmacology or Medicine that describes the regulatory and pharmacology outlined in this book. All safety pharmacology areas outlined are accompanied by comprehensive background information, detailed figures, inclusive tables and an up-to-date list of the most important references for the area discussed. This book also introduces topics in an easily understandable format for researchers in many varying disciplines.